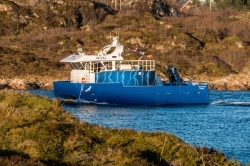 Plan B Energy Storage (PBES) has been awarded the contract to provide the energy storage system aboard Norwegian electric fish farm vessel Elfrida. In operation since February 2017, the vessel provides up to 12kts speed and a full eight-hour shift per charge. In other news, it was recently announced that Pangea Marine Trade and Noris Automation will offer PBES energy storage to marine customers in Southern Europe.